The first NASA science officer, Expedition 5 Flight Engineer Peggy Whitson, working at the Microgravity Science Glove Box in the Destiny Laboratory in 2002. Shuttle-Mir programme, she also served as the co-chair of the US-Russian Mission Science Working Group. After a career that included the pursuit of scientific knowledge, developing experiments for space flight, working with international partners and training as an astronaut, she was the logical choice for the role of science officer on ISS. 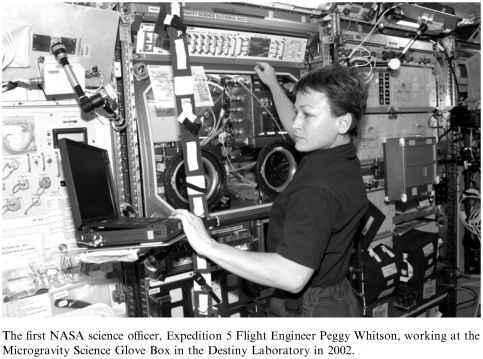 During her mission (184 days between 5 June and 7 December 2002), Whitson conducted science investigations in bioastronautics research (eleven experiments), physical sciences (nine experiments), space product development (five experiments), and space flight development (four experiments). The work she conducted aboard the station included activating and verifying the Microgravity Science Glove Box. Her SO role had to fit in with her duties as a flight engineer and her assignments on the station's robotic arm system, as well as qualifying and training for EVA using Russian EVA hardware and systems. 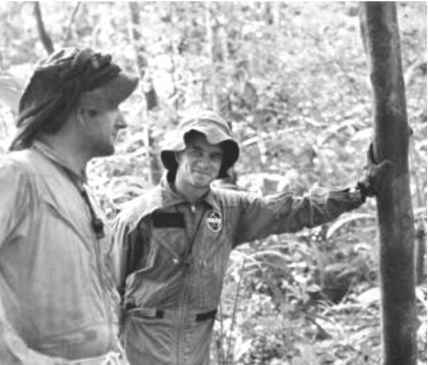 During her pre-flight interview, Whitson revealed that she considered herself to be both a scientist and a builder and explorer, and that becoming an astronaut had focused all of her previous skills and experiences and brought her many new challenges and demands. During the flight, she remained busy with the "mundane" chores of housekeeping and maintenance activities, punctuated with good measures of "fun," such as the robotics and science work and a 4 hour 25 minute EVA. When she was preparing to leave the station at the end of her residency, Whitson admitted to mixed feelings; eager to see family and friends after such a long time away, but also realising that she was not going to live aboard the ISS anymore.